Our shop is a feast for the eyes and a temptation for the taste buds. 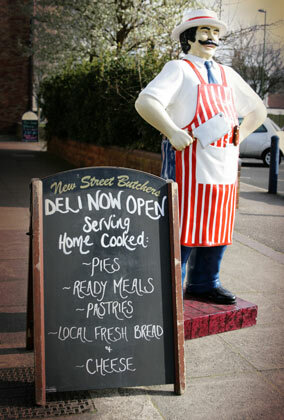 Well-loved by locals, New Street Butchers & Deli is firmly on the West Sussex foodie map. If you’re passionate about quality food, and appreciate friendly, knowledgeable service, then you have probably already discovered our traditional, family-run butcher. But if you haven’t, please pay us a visit. Our shop is full of the finest, free range meat and seasonal local produce. You will always receive a warm welcome and as much advice as you need on how to store, cook and enjoy your food. Our team of experienced butchers has high standards – they won’t be happy unless you experience brilliant service while you’re with us – and exceptional food when you get home. We are passionate about real, wholesome food. We get most of our meat from local Sussex Farms, such as Prinkles Farm in Hurstmonceux and Downsview Farm in Cootham. All we add is traditional butchering skill — and sometimes a little bit of New Street Butchers’ special recipe seasoning, marinade or glaze. With the recent addition of the deli, adjoining the butchers, there’s now even more to see, buy and savour. Freshly baked breads, cakes and pies; locally produced chutneys and jams; delicious British cheeses; local wines, cider and ales. It’s well worth a browse each time you visit, as we’re adding tasty new products all the time.